B. Thomas (Arlington, Texas, United States) on 3 July 2011 in Lifestyle & Culture and Portfolio. June 12th at a concert under a full moon. That is the moon on the left side. Happy 4th tomorrow!! Excellent this photo from the firework. Wonderful! I agree....5 stars! Happy 4th! Wowzers! This is fantastic!!! Happy fourth to you. happy fourth shot, beautifully crafted!! wow . . Congrats on the Spotlight with this wonderful burst of color. Very well done ! @Ronnie 2¢: Thank you, Ronnie. Beautiful how you captured the moon as well! Just saw this fantastic shot, Barbara. Superb work and congrats on the spotlight! @Jason Politte: Thank you, Jason. This is a very good capture!!! I wish....but never manage! @Tamara: Thanks so much, Tamara. Superb light , colors and composition . Very beautiful ! Congratulations for the spotlight ! Magnificent job here, Barbara - and so greatly deserving of Spotlight award! Fantastic. What a beautiful shot! I hope you had a great fourth as well!! Congrats! superbly captured, barbara, and a very clever choice for the spotlight! congratulations! Wow--the Spotlight!! Congratulations! This shot is superb, well-deserving of the attention. Good job!!! Beautiful shot and congratulations on the spotlight! Hey, congratulations on the spotlight! Way to go! I rarely see strong horizontal fireworks images. Nicely done. A beautiful image with fabulous colours and light. Congratulations on the spotlight !! A beautiful wonderful celebratory image, Barbara !! Congratulations on the AM3 Spotlight. Bravo . 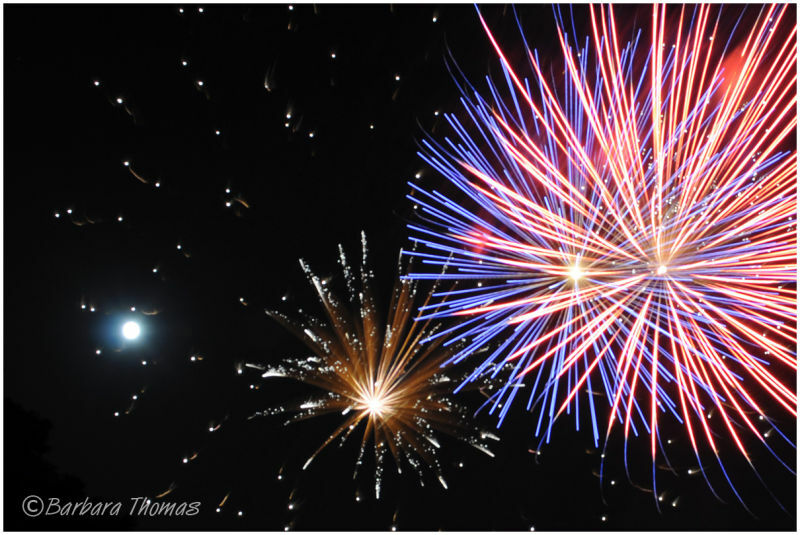 Congrats, Barbara, on the spotlight....superb fireworks image! One of the more unique shots I've seen of fireworks. Congrats on the spotlight. Stunning! Just marvelous! Congratulations on the Spotlight! Barbara....what an awesome shot of these fireworks! I have been trying for years and can't seem to do it! Deserving of the spotlight picture! !